President-elect Donald Trump's band of billionaires keeps growing. The latest addition to his team of ultra-rich administration officials is Vincent Viola, a New York businessman and NHL owner who was announced Monday as Trump's pick for secretary of the Army. The civilian post serves under the defense secretary and is subject to Senate confirmation. Viola's military bona fides include a degree from West Point and service as an infantry officer in the 101st Airborne Division. He joined the U.S. Army Reserve after active duty. But he's better known for his time on Wall Street, where he amassed a fortune valued by Forbes at $1.8 billion. Viola was born in Brooklyn and started his career in finance as a trader on the New York Mercantile Exchange, in downtown Manhattan. He became its chairman months before the September 11 terrorist attacks and navigated it through the aftermath. He later founded a series of companies -- most notably the multimillion-dollar high-frequency trading firm Virtu Financial. High-frequency trading, in which traders use computer algorithms to take advantage of fractions of a second in stock fluctuations, came under attack in the 2014 book "Flash Boys." Author Michael Lewis argued that the practice was a way of rigging the market. 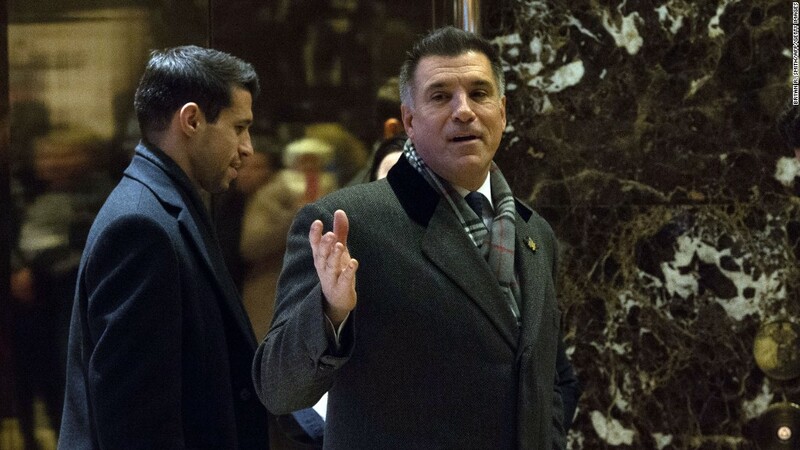 Vincent Viola arrives at Trump Tower on Friday. The book caused a furor on Wall Street and was said to have delayed Virtu's initial public offering by a year. The company went public in April 2015. If Trump's picks are confirmed, Viola will join an administration stacked with other billionaires, including Wilbur Ross, a debt investor tapped for commerce secretary, and Betsy DeVos, who is married to an heir to the Amway fortune and would run the Education Department. Todd Ricketts, part of the billionaire family that owns the Chicago Cubs, is Trump's choice for deputy commerce secretary. Unlike the president, these top administration officials are required to address any conflicts that their finances may pose to their government duties. Federal law says they must get rid of any problematic holdings or otherwise recuse themselves from certain matters. Viola spent much of the past decade as a near-neighbor to his new boss -- and appears to have shared the same taste for gilded furnishings. Viola's 20,000-square-foot Manhattan townhouse, a dozen blocks north of Trump Tower, went on the market for $114 million in 2013, according to Variety, which described the 19-room home as "luridly lavish" and "turgidly ornamented and giddily gaudy in its unrestrained grandiosity." The price was lowered to $98 million in 2014 before the property was reportedly pulled from the market. Viola did not immediately return a message from CNNMoney. In 2013, Viola bought the NHL's Florida Panthers for $160 million, according to Forbes. The team tweeted its congratulations Monday morning, noting that the Panthers had made the playoffs under his ownership last season. They lost in the first round to the New York Islanders. --CNNMoney's Matt Egan and Kathryn Vasel contributed to this story.